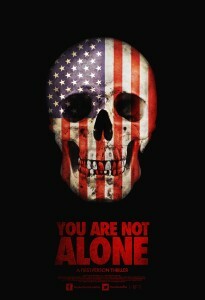 You Are Not Alone is a unique take on the home invasion thriller that is directed by Derek Mungor and stars Krista Dzialoszynski, David O’Brien and Mary Mikva. The film follows Natalie, a young college student returning to her hometown to celebrate the 4th of July with her friends and family. Despite the warning from the local Sheriff about a town curfew she attends a local party. After having a few too many drinks she decides to walk home alone unaware that she is next on the hit list of a relentless sociopath. You Are Not Alone may share plenty of similarities with 2012’s Maniac, but here the film is told entirely from the perspective of the victim and, in doing so, it becomes its own nerve-shredding nightmare as Mungor takes this gimmick and uses it to slowly build something that is so suspenseful that it taps into genuine real-life fears. This is a film that is not easily forgotten. That said, You Are Not Alone takes a while to go anywhere and uses the first 45 minutes of the film to anchor a sense of realism. This will no doubt upset the less patient viewer but I urge you to keep watching. By the time the film moves into the second half, the chaos begins and the film becomes something much darker. So what was once a town that was so busy with life in the daytime soon melts into a dark and very cold environment that immediately develops a sense of vulnerability providing the perfect foundation for Mungor to unleash a series of events that feel as authentic as they come. The success of the film is buoyed by the cast who are fantastic. Every performance feels natural which helps the credibility of the film. Krista Dzialoszynski plays the role of Natalie and, even though we never see her face, the way she delivers her role is fantastic and she does a brilliant job and I found myself invested in her character. Joining her is David O’Brien whose performance feels just as natural as Dzialoszynski’s but it’s a much smaller role. As for the sociopath, the role of the killer is shared between Dan Abbate & Sean Cooley. The role is very simple: an unknown assailant with no clear motive other than to kill helpless victims, but there is something so unsettling about knowing nothing about the killer. This is what adds to the overall power of the film. We know lots about the lead but nothing about the killer which, again, taps into the very fear that something like this could happen to anyone at anytime. I strongly recommend picking up a copy of You Are Not Alone if you’re looking to experience a slice of real terror. Mungor has done a terrific job in pulling off what he has with a limited budget. He’s clearly a talented filmmaker and he knows what it takes to scare audiences. Just be sure that you double-check the locks on your doors before you watch.